Former Saginaw Arthur Hill guard Jaylen Bland has committed to Murray State. Bland transferred to Cleveland High School (California) before his junior season. The 6-2 Bland had been ranked among the top underclassmen prospects in Michigan. Daniel West, among the top guards in the state as a senior at Saginaw High, will play at the University of Rhode Island. West has bounced around a little bit, having originally committed to a pair of D-1 schools (Tennessee and Bradley). After a short stint on the JUCO circuit at Pensacola (FL) last season, West is on his way back to D-1. He averaged 11 points, five assists, three rebounds and three steals at Pensacola. West had 13 assists in a 4-point loss to JUCO powerhouse Chipola back in February. In one year, he will be joined by Kalamazoo Central standout TJ Buchanan, by all accounts a recruiting coup for RIU. Tory Jackson update: Milwaukee Bucks? Here’s an update on one of the best players to come out of Mid-Michigan in that last five years, Saginaw Buena Vista’s Tory Jackson. Former Notre Dame point guard Tory Jackson is expected to sign with the Milwaukee Bucks for training camp according to his agent, Chris Luchey. During his senior season, Jackson averaged 9.6 points and 5.3 assists to post an impressive assist-to-turnover ration of 2.68 – among the best in the country. The 5-foot-11 Jackson attended NBA Draft workouts with the Portland Trail Blazers, Memphis Grizzlies, Atlanta Hawks, Utah Jazz, New Jersey Nets and the Indiana Pacers as well as the Portsmouth Invitational but ultimately went undrafted despite being a four-year starter for the Irish. He then planned to play in the Vegas Summer League for the Chicago Bulls, but those plans went awry at some point. I always remember being at the top of the key and the feeling of looking at an offensive player dribbling down the court. You always end up locking eyes with your opponent and the arena seems quiet. It’s a very pure moment where you know that you are willing to give everything you have to stop your opponent from scoring. How many players do you know who think like that? FLINT, Michigan — The incoming freshmen class didn’t have to be spectacular to keep Mott Community College among the elite JUCO programs in the country. The Bears went 17-1 in conference (26-4 overall) and won the state championship last season with a freshmen-laden squad. The Bears eventually lost at the buzzer in the semifinals of the regional tournament by a point. It was the 15th straight season of 25 or more wins for the program, but that’s not enough for the average spoiled Mott fans — they want more titles. This year, Mott’s highest impact players will primarily be sophomores, but not for lack of talent in this class. Hall-of-fame head coach Steve Schmidt has once again ushered in a solid group of prospects for 2010-2011. Walter Davis, 6-4 g/f Memphis (TN) Southwind High School: Long and lean jumper with an improving perimeter game. Davis is active on defense and runs the floor with speed and athleticism. He spent most of his high school career as a frontline player, but he has shown an ability to knock down mid-range jumpshots since coming to Mott. He’s an exceptionally quick jumper, which should translate to rebounds. Davis could mirror the hybrid guard/forward role that sophomore TJ Cameron played last season for Mott. Former Flint Carman-Ainsworth big man Jaylen Larry will be playing college ball at Rock Valley College in Rockford, Illinois this season. The 6-7 forward was courted by numerous JUCOs across Michigan before choosing Rock Valley. Larry has potential to be a very solid big man at the JUCO level if he is dedicated to the program on and off the court. He has above average touch around the basket and, when he’s in shape, is more athletic than he’s given credit for. Several people I talked to believed Larry to be better than his high school teammate Dee Chapman, who will be playing his college ball at Prairie View A & M.
RVC competes in NJCAA Division III and went 12-18 last season. They return only three players from that team. Kelvin Torbert, the former Mr. Basketball at Flint Northwestern and standout at Michigan State will continue his professional career in Greece this season after a stint in Belgium. Torbert is still probably the most dominant high school I’ve seen up close. He was unstoppable. 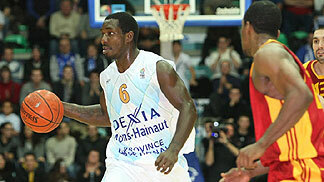 Torbert will play for Iraklis in Greece’s 1A Division. Greece has one of the top pro leagues in Europe. Many NBA players have played for Greek teams, including swingman Josh Childress, who famously spurned re-signing with the Atlanta Hawks to sign with Olympiakos a few seasons ago. Childress will return to the NBA with the Phoenix Suns this season.